Sony posted a net loss of around $115 million for the previous quarter due to stalling TV demand, but it is still magnitudes less than what was reported for the same period the year before, plus Sony forecasts a decent profit for 2013, so things seem to be on the mend. The Japanese sold 8.7 million smartphones in the quarter, keeping its place int he top 5 makers. Sony's CEO Kaz Hirai will have a pivotal year ahead of him, as he finishes the restructuring of the company and streamlining operations, and trying to introduce new products under the One Sony umbrella that communicate seamlessly with each other. In the smartphone and tablet part of the strategy it already has winners with the Xperia Z and Tablet Z that are sure to score mega sales given the looks and specs, and with the rumored Togari flagship for the second half of the year, it might keep biting chunks of Samsung's formidable market share in the universe occupied by little green robots. good progress Sony, keep it up. It is not a loss. Sony made a profit of about $ 550 million. I want my short battery life TFT screen Xperia Z already as I can't wait to play with my $800 gadget in the bathtub, which is very cool. how do you know about the battery life?? This review claims 4-4,5 hours of intensive usage, based on the release 4.1.2 SW and obviously the release HW. They say both the screen and the HW eats huge amount of juice, and energy saving mode only usable when it doesn't eat up too much energy anyway.http://mobilarena.hu/teszt/sony_xperia_z/uzemido_osszegzes.html The biggest issue this year will be battery life. After the Note II and MAXX HD reached impressive results, we're going back to the daily worry. The S4 Pro @ 5"FHD would require at least 3000mAh for comfortable daily usage where the A15s may need even more, there's so much software tweaks can do. Rumors say Samsung is struggling even with the energy-friendly SAMOLED & Exynos Octa on board. To be honest, no CPU clock speed should come over 1,2GHz, a little amount of extra performance comes with huge energy sacrifice, and these newer products push toward 2GHz which is serious overkill. A15 architecture handles absolutely everything lag free even at 1,2GHz. People will be underclocking like crazy this year. please leave a source in English. i could understand nothing. I'm the source in English. It's a trustworthy site (why they get early review units), just translated their battery impressions. It's funny now, but you won't find as much joy in it when you'll go charging it twice a day. I might, better screen, battery life and price point, but better yet is waiting for something like an A15 Nexus 5. Good luck hoping that ignoring issues with a device will magically make them go away lol. What does your comment have to do with his prototype assumption...? Chances are your average everyday consumer is not gonna use it for 'intensive usage' and what does your source state that intensive usage is, constant gaming, video? In which case 4.5h intensive usage is impressive, and with non-intensive usage your looking at about 20ish hours of battery life, which, is more than a hell of a lot of phones out there currently.. You're argument is void. Also on a side note, the 'octa' chip is overhyped, all it is is 2 quad core chips, one A15 and one A7 which can only be exclusively used and clocked the same, 8 cores won't necessarily speed things up i'm afraid, it's just for marketing purposes..
Sony May or may not overtake Samsung in numbers but in Quality and Performance Sony is way ahead of Samsung. Samsung is no where near Sony Experience in smartphones in build quality as well as looks and feel. 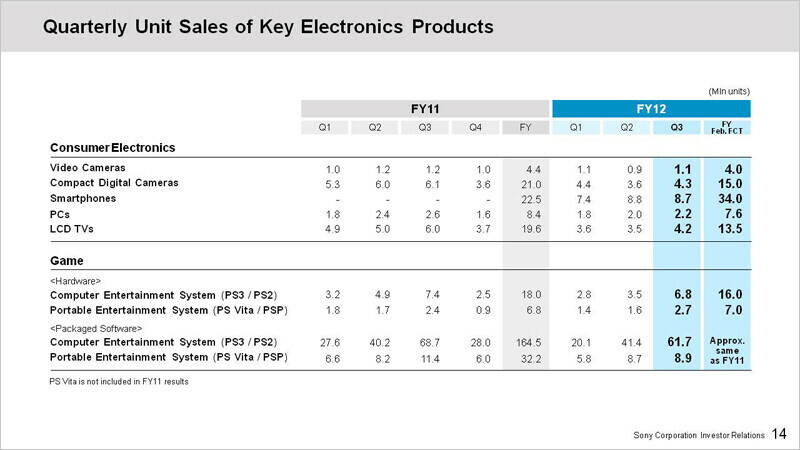 Tell me pankajgupta what sony device you owned. I own Xperia Pro and have extensively used Xperia S, Xperia Miro, Xperia U, Xperia P. Samsung's i have used lower end Galaxy Y, Galaxy Fit, and also Galaxy S, Galaxy S2, Galaxy Note, Galaxy S3. Yes sony is really good at design, hardware, but thier need to work in the software part. I have the sony tablet s, xperia tablet s walkman z those three products are well built but in the software part are bad. Sony needs to step up if they want to compete with samsung. its just a year that Sony is independent in mobile production, but i think it is doing a pretty good job. they can make lots of problems for Sammy and IPhone.